Install the application software (if applicable), as described in the installation instructions that accompany your software. Check your driver and application development environment (ADE) readme files for specific version compatibility. Install NI-DAQmx from ni.com/downloads/drivers. Complete the instructions. Restart Later to install more NI software or documentation. Shut Down or Restart if you are ready to install your device. If you have problems installing your software, go to ni.com/support/daqmx. (Optional) Mount the FieldDAQ device to a panel. Carefully align and connect one end of the Ethernet cable to Ethernet port 0 on the device, and the other end directly to your computer or any network connection on the same subnet as your computer. Power the device by carefully aligning and connecting the power IN port on FieldDAQ to an external 9 V DC to 30 V DC power source with the 5-pin L-coded M12 power cable. To add the FieldDAQ to your software configuration, open NI MAX on your Windows host computer. 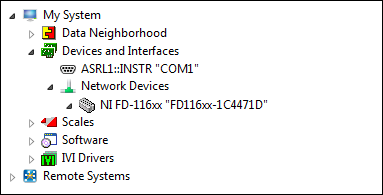 Expand Devices and Interfaces»Network Devices. If the device is on your local subnet, the device automatically appears in the list of available devices. Right-click the FieldDAQ device and select Add Device. 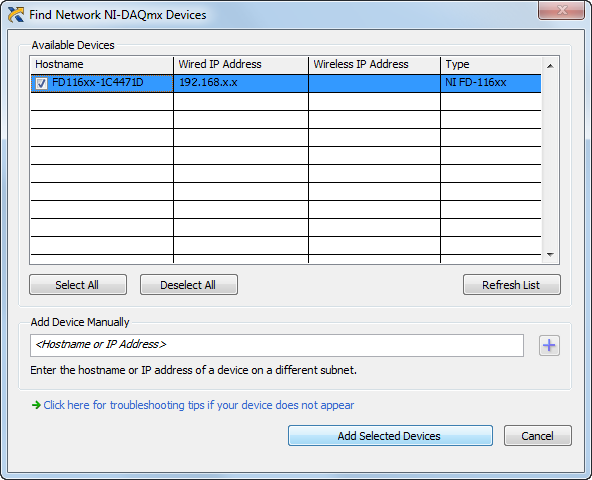 If the device is not on your local subnet, right-click Network Devices and select Find Network NI-DAQmx Devices. The FieldDAQ device icon changes from white to dark grey, indicating that it is recognized and present on the network. If you connected the FieldDAQ device directly to your computer, ensure your network card is configured to obtain an IP address automatically, then click Refresh List. If you connected the FieldDAQ device directly to your computer, the setup time may be longer. Wait 30 to 60 seconds after the STATUS LED turns off, then click Refresh List. Contact your system administrator to confirm that the network is working and that a firewall is not interfering with discovery. For additional troubleshooting resources for the FieldDAQ device, refer to the Troubleshooting Device Connectivity in this guide and the Finding a Network DAQ Device in MAX topic in the Measurement & Automation Explorer Help for NI-DAQmx.